You’re probably thinking that I always love to cook food and write about it. Right? Wrong! Sometimes, I just don’t want to see food that needs to be chopped and then cooked and wait around babysitting it until it’s done. Sometimes, I just need a break from cooking. And that’s when we dine out. Every time we go to a restaurant we try to turn it into a memorable experience with great food selection and lovely atmosphere. After all, if you are to spend money, you’d better make it worthwhile! Adrian and I moved to Pittsburgh a couple of years ago. We knew the area, but we weren’t very familiar with the restaurants and dining options. So, we definitely had some exploring to do. And, we weren’t disappointed with what we found in the Steel City. On the contrary – we were extremely pleased. Il pizzaiolo means the pizza maker, in Italian. Well, let me tell you that our pizza maker (Il Pizzaiolo restaurant founded in 1996) in downtown Mt. Lebanon has some pretty extraordinary food selections and spectacular brick-oven pizza. The rustic atmosphere and the intimate summer patio complement the restaurant, while the chic wine bar gives it a modern edge. Soon, it became our go-to restaurant and before I got into real cooking it was our every other day go-to restaurant. We frequented this restaurant so often that the entire staff knew us. And, we also got to know them. Let me tell you that we were fascinated by their commitment to always serve excellent authentic Italian food. They are so devoted that they fly their mozzarella di bufala straight from Napoli, Italy, every week and they also make their own mozzarella in-house. They hand-make their own sweet fennel sausage, meatballs, pasta and antipasto vegetables, too. As you can imagine, we’ve had almost everything on the menu. 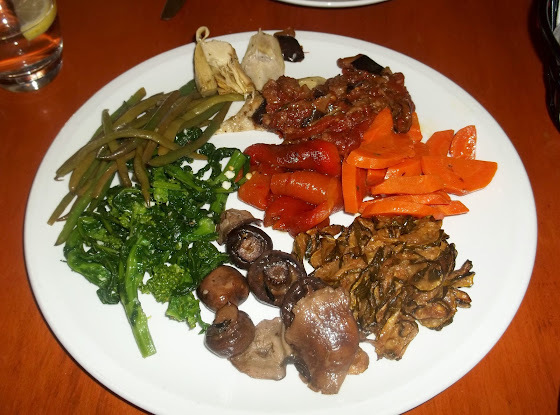 I’ll start with the Antipasto Napoli, a delicious mixture of roasted vegetables from eggplant, zucchini, mushrooms and carrots, to cauliflower, artichokes, rapini, green beans and red peppers. 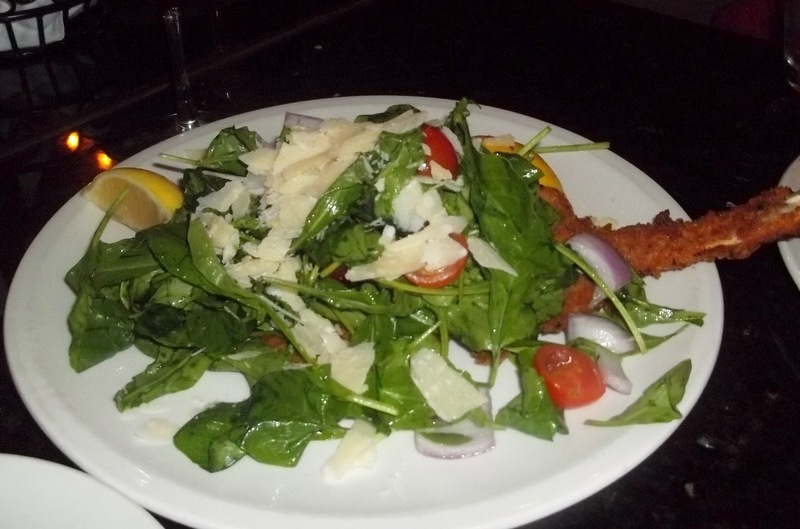 This appetizer has now become a must, every time we go to Il Pizzaiolo. The veggies are roasted to perfection and drizzled with extra virgin olive oil. What you get is a happy marriage of great contrasting colors and textures, sweetness, spiciness, light bitterness, and a touch of acidity… A simple, rustic and yet terrific dish. 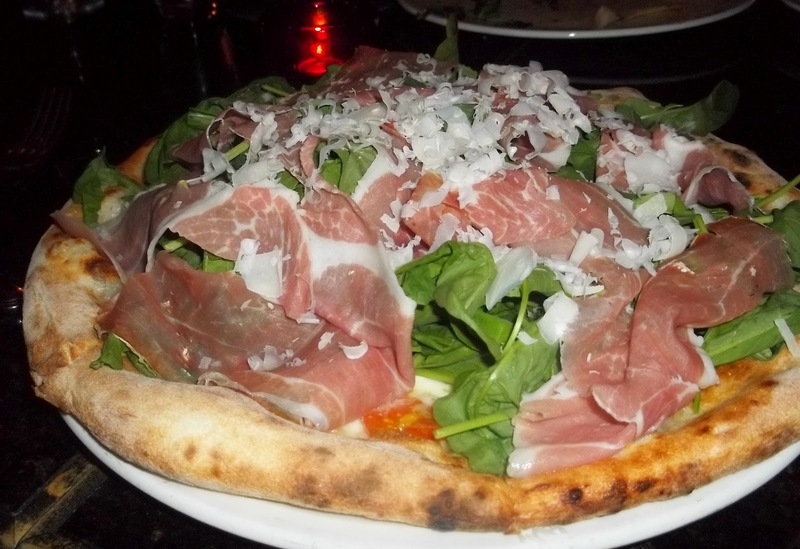 Next, I have to mention our two favorite pizzas: Pizza Capricciosa and Pizza Prosciutto e Arugula. 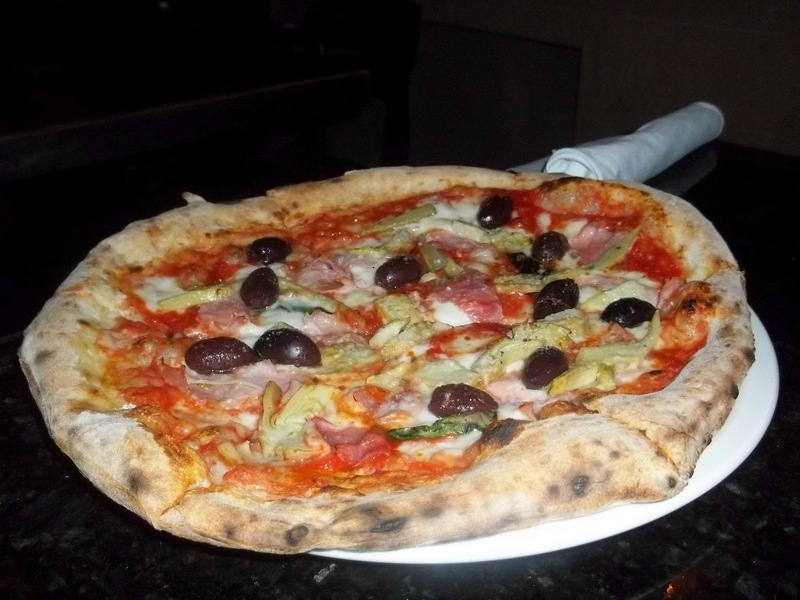 Pizza Capricciosa offers impactful flavors and an abundance of ingredients. The crust is thin and light and you could eat it all day long. The San Marzano tomato sauce adds richness while the smooth fresh mozzarella brings that now famous gooeyness. This pizza is elevated by the bold meat element of prosciutto cotto, the tangy artichokes, briny gaeta olives, while the fresh basil gives this dish fragrance and depth. It is definitely a keeper! Pizza Prosciutto e Arugula is certainly lighter. One of my favorite leafy greens, the peppery arugula, gives this pizza a lovely earthiness, while the salty prosciutto brings in another level of texture. And let’s not forget about the freshly shaved Parmigiano-Reggiano, which chef Mario Batali calls “the indisputable king of cheese”; I tend to agree. These flavors just work together beautifully. The pasta dishes…oh…the pasta… now, they bring out the heavyweight contenders. What should I start with? I’ll start with, perhaps our favorite dish, Pappardelle con Salsiccia. There are a lot of great flavors in this dish. 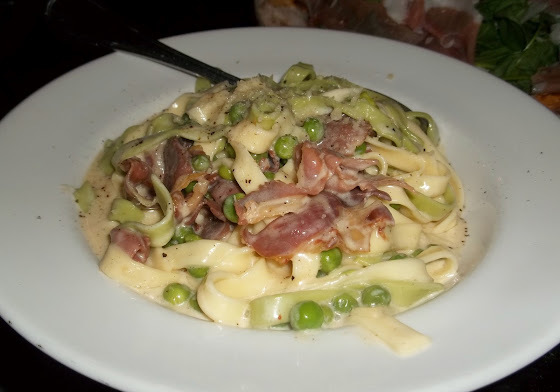 You have the hand-made fresh pappardelle, which are cooked to perfection. Then, you have the hand-made sweet fennel sausage, the crunchy onions, which give a nice bite and extra sweetness, and a hint of wine. All of which are drowned in a tasty marinara sauce. You’ll definitely feel satisfied after this pasta dish. Next, I’d like to tell you about, what I call the drunken pasta, Penne alla Vodka. A good bunch of al dente penne pasta is covered in a rich, buttery, vodka, tomato and cream sauce. The freshly ground pepper gives it a kick and the Prosciutto di Parma adds a bit of saltiness to balance out the dish. Paglia e Fieno is another successful and colorful pasta dish. The bi-colored hand-made fresh spinach and egg tagliatelle swim in a smooth cream sauce while the peas and prosciutto brighten the dish and boost the flavors. If you happen to go in for lunch, don’t miss out on the fabulous Panini, and most importantly the Garibaldi Sandwich. Unfortunately, this sandwich is not listed on the menu, any longer. I really don’t know why. It’s my favorite panino on their menu. However, they will always make it for you if you order it. 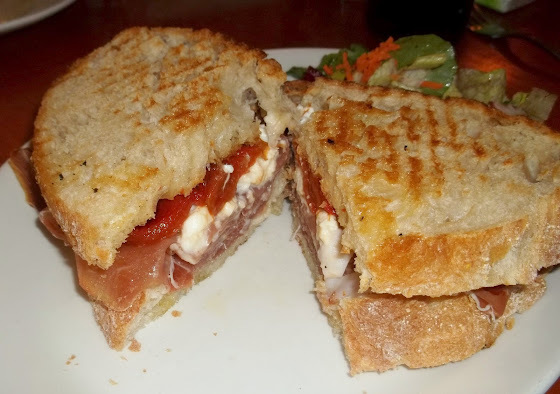 What you get is a perfect blend of crunchy toasted bread, meaty prosciutto, cheesy mozzarella, and roasted red peppers; and a light salad on the side. This is a delicious and fully-satisfying lunch. Also, not be overlooked are the Antipasto Misto, Pizza Margherita (DOC), Rigatoni alla Siciliana, Spaghetti alla Puttanesca, Linguine alle Vongole, Parmigiana di Melanzane and the Manganaro Sandwich. 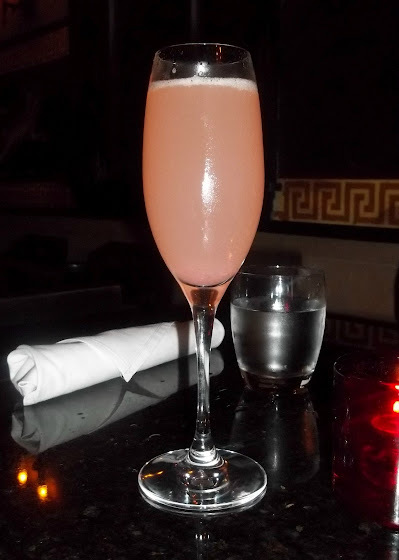 And, to top it off, order a nice, bubbly and fruity Bellini cocktail. Whether you’re looking for lunch, a quiet dinner or a night out with friends, Il Pizzaiolo has it all. So, try this Italian treasure and you’ll be transported to Italy in an instant… Salute! Thank you so much for those wonderful reviews. I can't agree with you more about Il Pizzaiolo. It is one of my favorite places in all of pittsburgh. Another place I enjoy going to for a BYOB establishment is Piccolo Forno. It serves wonderful dishes and located in Lawrenceville making it ideal for downtown dinner meetings. As always you know your food and thanks for the review! Hi! My husband and I just moved to Mt. Lebanon and I found your blog via Urbanspoon. We are going to check it out this restaurant soon! Are there other great places you would recommend in this area? Thanks!